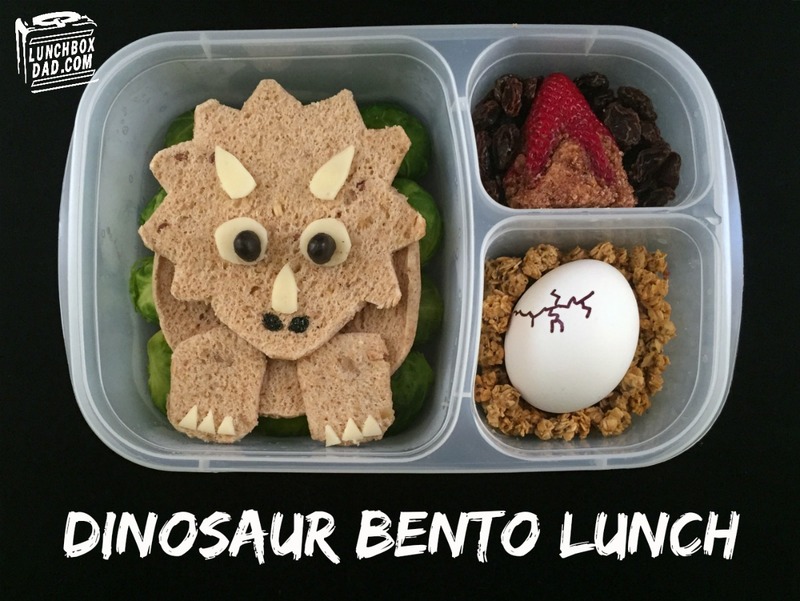 It's weird that I haven't made more dinosaur lunches for my kids but honestly they haven't really been crazy about them. Until now. My daughter has been learning about dinosaurs and fossils in school. She even went on a school field trip to the museum to learn even more about them. She is hooked right now. My son is currently having fun with Transformers and loves Grimlock the Dinobot. All of that created the perfect storm of Dinosaur mania in my house. 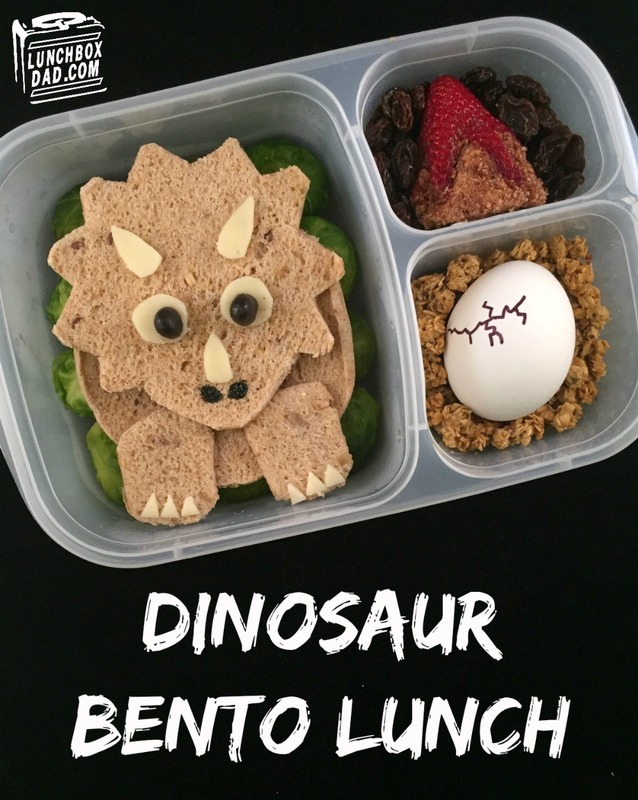 So it was natural that I put together a fairly simple Triceratops lunch. My daughter and I were discussing the best dinosaurs and Triceratops is towards the top of each of our lists. Plus this dinosaur was fairly easy to fashion out of a few simple shapes. I made the lunch in one of the new Easy Lunch Boxes Urban colors. Remember to follow me on my social media sites for even more fun, recipes, and parenting articles! Just click on the buttons to the right for easy access. 1. Cut the Triceratops shape out of bread. I used sandwich thins because they were already the correct size. It's basically the head, a circle for the body, and two rectangle shapes for the feet. 2. Paste dinosaur body shapes together with whatever sandwich filling you choose. We had leftover tuna so I used that. Cut the white facial and feet features out of sliced cheese. They don't have to be perfect just cut out one and use that to make the other ones that are like it. Paste them on with a dab of cream cheese. 3. For the black pupils I cut a black yogurt covered raisin in half, but you could also use a regular raisin. Paste them on with dabs of cream cheese. The nostrils are made from black food coloring. 4. Place the vegetable background in the main container and put the dinosaur sandwich on top. Make sure the vegetables are dry so it doesn't make the sandwich soggy. 5. In one side dish place hard boiled egg. Surround with granola for a rock or sand type feel. 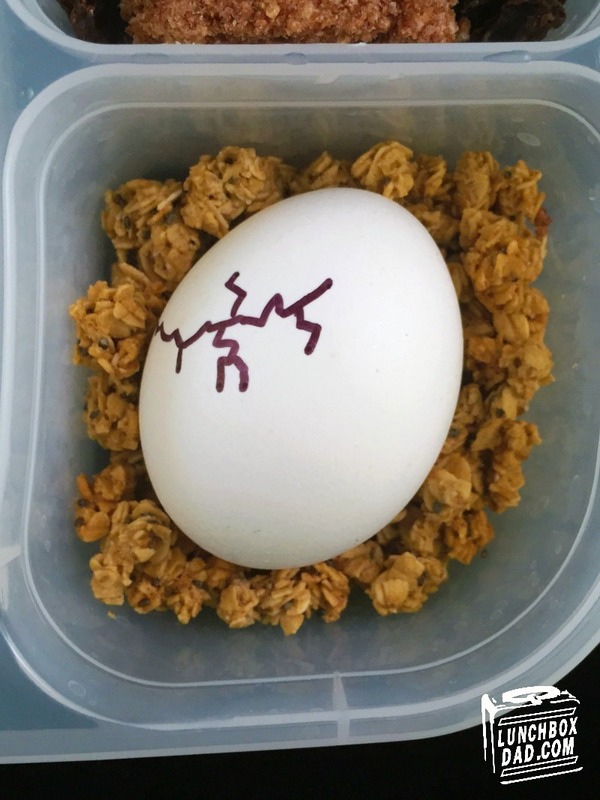 Use a black marker to make a "crack" in the dinosaur egg like it is hatching. 6. For the volcano, cut off the bottom part of a strawberry. Hollow out the middle and slice "arm" shapes coming down so it looks similar to an octopus. Shape a small ball of cream cheese into a pyramid shape. Roll it in graham cracker or cereal crumbs. Press the strawberry down on top of cream cheese. Lightly press on the lava "streams" as well so they are even with the cream cheese and not just resting on top. This gives the illusion of lava flowing down the volcano. 7. Drop raisins in a side dish and place volcano on top. Sprinkle more raisins on the sides to keep the volcano from moving around. 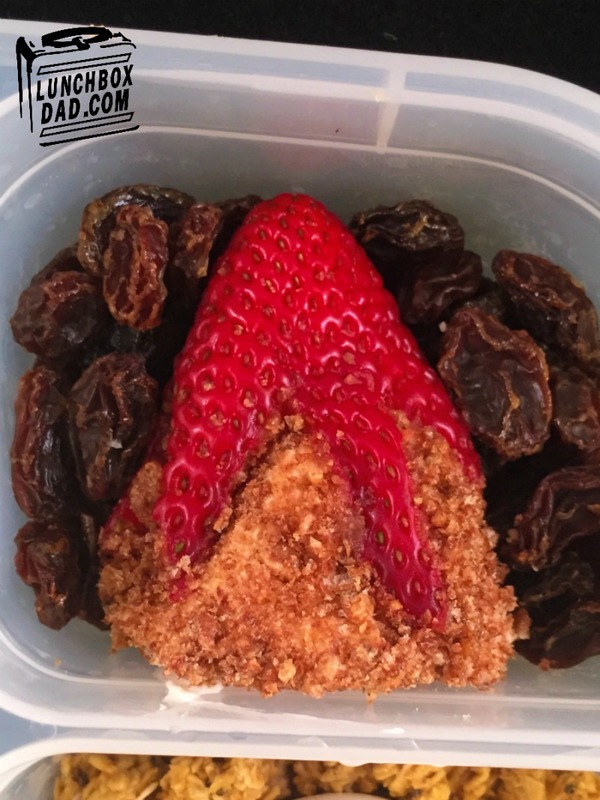 The cream cheese goes well with both the strawberry and the raisins so your child doesn't just have to eat a big ball of cream cheese!